On May 8, 1893, Edd Roush was born. Before his major league career ended in 1931 he would win two batting titles, top forty doubles and thirty steals, and win a World Series. Richard looks back at his career. I know, I know, you were expecting the All-Mexican team for Cinco de Mayo. I resisted that urge this week and instead decided to add another article to my occasional series, “Richard Learns More About Players He Should Know More About.” We’re still taking suggestions on a better name, incidentally. But for now, we will take the unfortunate name as a trade-off for the benefits of learning about those players who, although I know a bit about them, are worthy of a full piece. Edd Roush is unquestionably one of those players. Before we do anything else, that isn’t a typo, his name—apparently his birth name—was Edd, with the double-D. Despite the hundreds of Edwards, Eddies and so on who played in the major leagues, Roush remains the only two-D Edd. Fortunately for him, there is far more to his legacy than a unique name. Roush made his major league debut with the White Sox in 1913, but his career really took off the following season, when he jumped to the Indianapolis Hoosiers of the Federal League. Roush no doubt thrilled the White Sox, since they had paid $3,000 for him, no small sum in those days, and got a total of nine games. Playing for the Hoosiers, Roush, at age 20, hit .325. The franchise moved to Newark the next season and become the Newark Pepper—apparently a trendsetter in the concept of singular franchise names—but folded after that year. Before the Federal League fell apart entirely, the Pepper sold Roush to the Giants for $7,500. While FL statistics are somewhat questionable, Roush’s two years there were apparently enough to more than double his value. After just a few months with the Giants—Roush supposedly hated playing in New York and did not get along with John McGraw—he was traded to the Reds, where he would achieve his greatest success. At the time, however, Roush likely received little attention because also going to Cincinnati was Giants great Christy Mathewson. Mathewson’s best days were well behind him—he would appear in just one game with the Reds—but his real purpose was to manage the club, which he did until the middle of 1918. It was under Mathewson that Roush began to flourish. In 1917 Roush exploded as a hitter, batting .341, which won him the batting title by nearly 15 points. He also appeared in the top five in OPS, hits and runs scored. Roush hit “only” .333 the next season but did display enough power to lead the league in slugging, largely on the back of his 10 triples and five home runs. The latter total was good for fourth in the league. The next season Roush won his second batting title, hitting .321 to edge out Rogers Hornsby. It was also his season of greatest team triumph as the Reds went to the World Series and defeated the Chicago White Sox. Of course, that series has always been tainted by the revelation of the White Sox throwing the games. For his part, Roush—who hit just .214—always claimed that the Reds would have won the Series even if it had been played on the level. 1920 is the first year of a six-year period for which we have not only stolen base data, but also caught stealing numbers for Roush. If that data is representative of his entire career, it would seem to suggest that Roush was an appallingly bad base stealer. Although Roush stole as many as 36 bases in a season—and topped 20 six times—in the six years for which we have data he was successful just 54 percent of the time. In 1923 Roush stole 10 bases, and was caught 15 times. Roush was obviously a fast guy; he spent his career in center field and drew comparisons to Tris Speaker for his defense, but on the bases his judgment seems to have left him. Roush continued to put up impressive numbers as his career went on, batting .350 in 1921 through 1924, and hitting well enough to lead the league in doubles in ’23. In the winter of 1926, Roush was traded, after 12 years with the Reds, back to the Giants for the memorably named High Pockets Kelly. Though Cincinnati was trading him at the right time—Roush hit just .296 with a .738 OPS after the trade (he would return to the Reds for the final year of his career in 1931)—Kelly was no better and the deal must be considered a wash.
Roush had a huge number of salary disputes during his career, missing spring training to hold out for more money far more than he attended it. Not surprisingly for someone so aware of his value and the limited time he had to make it, Roush was careful with his money and was able to retire comfortably once his playing career was over. He spent one season as a coach with the Reds, but otherwise split most of his time between Florida and his hometown in Indiana. 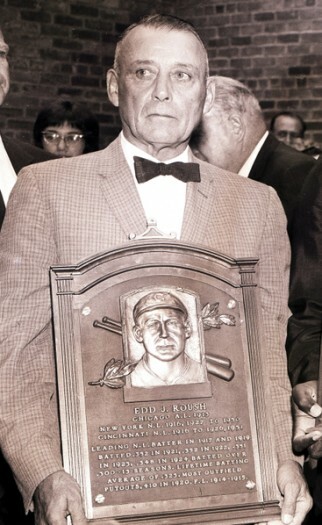 Roush was elected to the Hall of Fame in 1962 by the Veterans Committee and continued to attend spring training games for the rest of his life, dying shortly before a game in 1988. Very nice piece. I always enjoy reading about the stars of the game who receive little attention these days. On the wrist/arm strength, remember he grew up on a dairy farm, think about it. Milking cows, that’s got to be where the strength came from. My first thought on seeing the photo that accompanies this article was: Dang, fella, you’ve just been inducted into the Hall of Fame; can’t you manage a smile?